Rollin' Into Our Second Tour Session! NSCA is at it again this year, hosting two golf charity events to raise awareness for its IGNITE program, an initiative to attract, engage, and encourage students to join the AV industry. This year, we’re looking to surpass last year by raising $50,000 between the two IGNITE Golf Tour (IGT) events! Did we mention EVERYONE is invited to participate! For those who have attended our golf outings in the past, you can attest to how much fun this tournament is -- not to mention how much impact it had. We’ve raised over $77,000 for the NSCA’s IGNITE program with 584 volunteered hours during our past events . In order to reach this year’s goal of $50,000 between the two events, we are going to need your help! Please join us in supporting the IGNITE program and help grow the next generation of technicians, managers, sales leaders and innovators in the AV industry. Below are more details about each event, planned agenda, ways to participate and a link to register. The IGNITE golf tour is open to everyone. If you have a passion to golf, serve a great cause or just want to have fun, COME JOIN US! This will be a scramble golf tournament where every player hits a tee shot. The team selects the best shot to play and proceeds with that structure until the ball is holed. Whether you are able to participate in one golf outing, both outings, a sponsorship that doesn't involve any participation, or donate prizes, your involvement and support is greatly appreciated! The Ignite team visited the Tierney Bros. intern crew in Minneapolis, MN. Listen to Abby Johnson, Nikki Jurik and Megan Jahnz talk about why they love AV and all Communications Technology. The Ignite team visited the AVI Systems intern crew. Connor Gordon and Marianna Deibler talk about their love of marketing and programming in the Communications Technology Industry. The Ignite team visited the Legrand AV intern crew in Minneapolis, MN. Listen to Reid Dahl and Page Stanberry talk about why they love working for a Communications Technology manufacturer. Mentorship can mean the world to a person; it can make all the difference. That's why Nate Ross supports the IGNITE program -- an initiative aimed at attracting and engaging the next generation of audiovisual technology professionals. Well here we are. 76 days until the first IGNITE Golf Tour spot in Minneapolis, Minnesota at the Wilds Country Club. 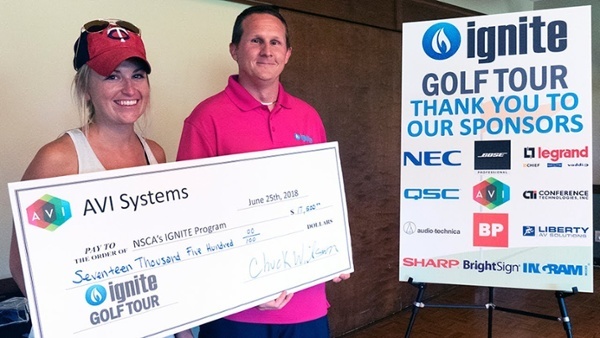 NSCA is hosting two golf charity events this year to raise awareness for its IGNITE program, an initiative to attract, engage and encourage students to join the AV industry. This year, we’re looking to hit that 350+ yard drive by raising $50,000 between these two events! Did we mention EVERYONE is invited to participate!